For my birthday, I got to live out one of my dreams. 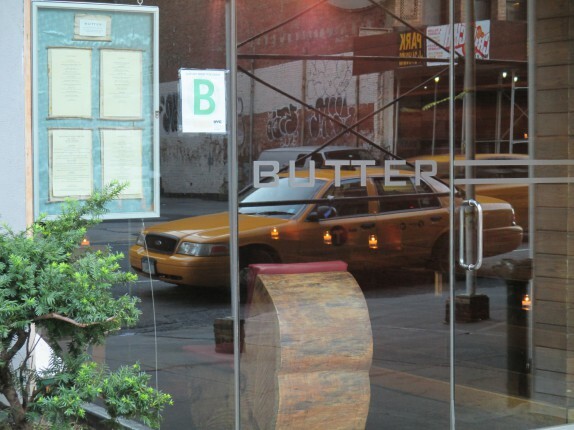 One was having a meal at Butter Restaurant in NYC. The other, well, I never thought would ever happen, but did in the middle of my meal at Butter. 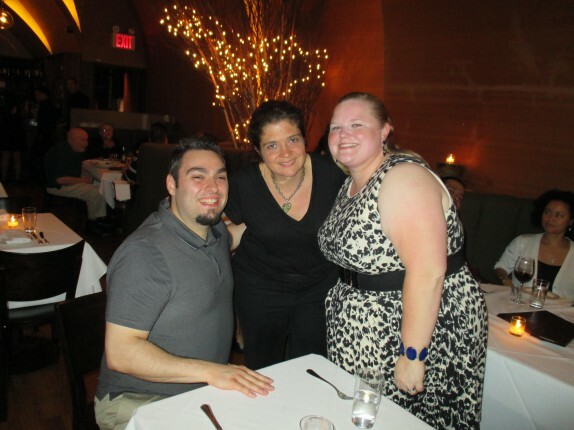 Butter is owned by Food Network celebrity chef and Iron Chef Alexandra (aka Alex) Guarnaschelli. I talk a lot about how much Food Network television I watch. A few years ago, they debuted a show called Alex’s Day Off, where Chef Guarnaschelli would cook some comforting foods and really show the simplicity of something intricate. What I liked about Alex’s demeanor was that she was very clear about what your senses should be experiencing as you cook, prepare, and taste the food. If you think about it, what’s the point of watching food on television if you aren’t given enough information to connect with the food? Alex has served on the judging panel on Chopped, and competed a number of times on The Next Iron Chef and finally achieved redemption and became an Iron Chef. While all of these things are super cool, it’s really her very verbal passion for food that has made me dream to eat in her restaurant. Given that it was in NYC and that pretty much solidified the fine dining experience as pricey, we made sure to make it count and have the chef’s tasting dinner. 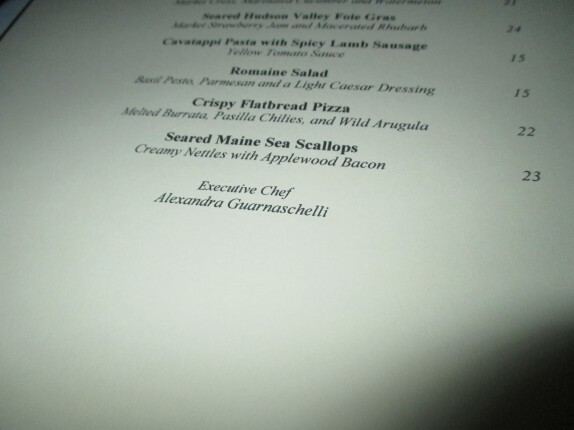 I believe it was around $90 per person for food, and I opted for the additional $60 wine pairing. 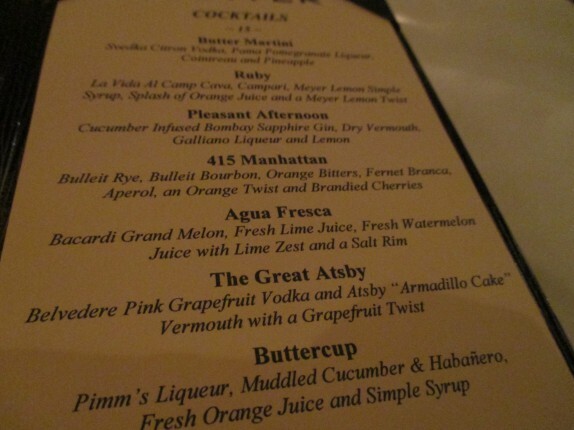 And that doesn’t mean that I didn’t also order the “415 Manhattan” (The name comes from the address — Butter is located at 415 Lafayette Street in the NoHo section of Manhattan). 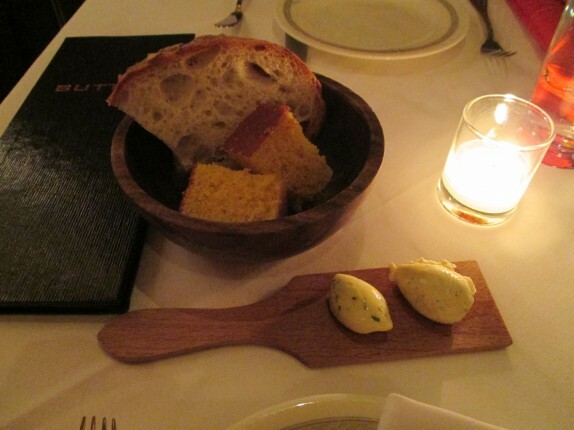 The first thing we were served was freshly baked breads and fragrant quenelles of compound butter. There was a classic brick oven Italian-style bread and a very moist and perfect corn bread. One of the butters was spiked with basil, the other with honey and citrus; it’s pretty obvious which butter went with each bread, but it was fun to mix and match. 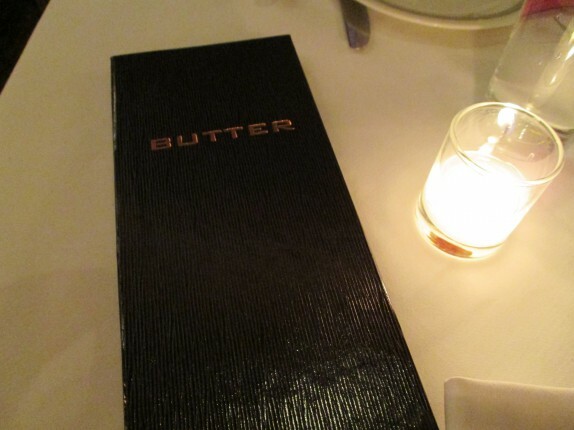 Our server made sure to explain that tasting dinners at Butter are done a little differently than many restaurants. Each person who orders a tasting dinner gets a sampling of a different course, this way, people can share and try the most things. Each of the courses are taken from the standard menu and each menu item is inspired by fresh and local ingredients. 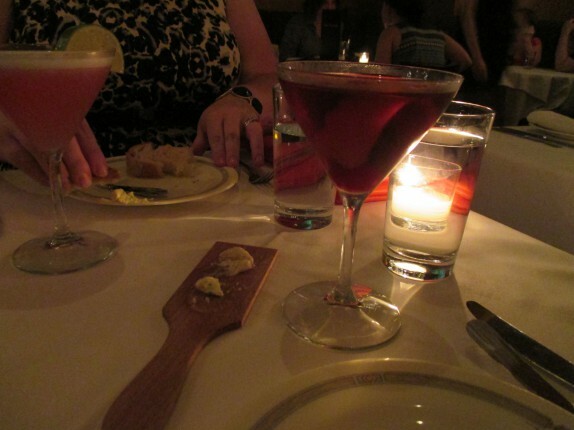 Our meal was late in July, which helps to bring many of the ingredients used into context. 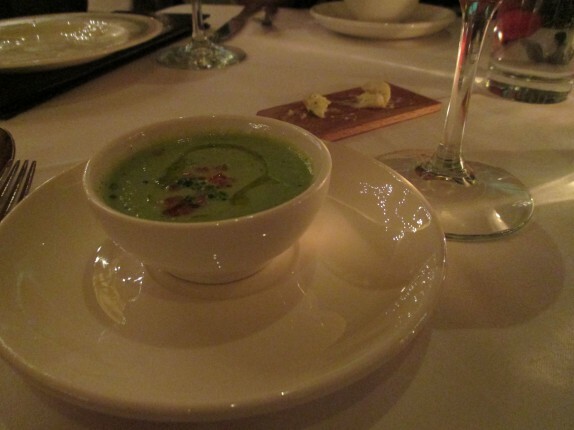 Our amuse bouche was a watermelon and cucumber gazpacho with cracked pepper and high quality extra virgin olive oil. And each of these components pushed through the few spoonfuls in a very bold and tantalizing way. It was a great course to awaken the senses for the meal that was to come. 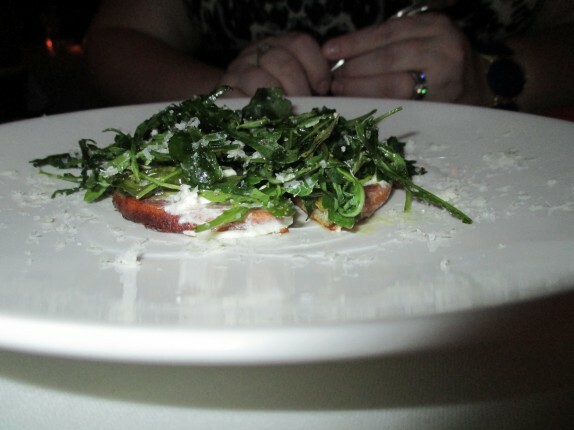 The first courses we got to try were the Crispy Flatbread Pizza (melted burrata, pasilla chilies and wild arugula), and a daily special that was a reimagination of green bean casserole. The most outstanding part of the flatbread were the pasilla chilies, which have a lot of the flavor of jalapenos but not as much heat. The green bean casserole was absolutely amazing, and was served cold, like a salad. 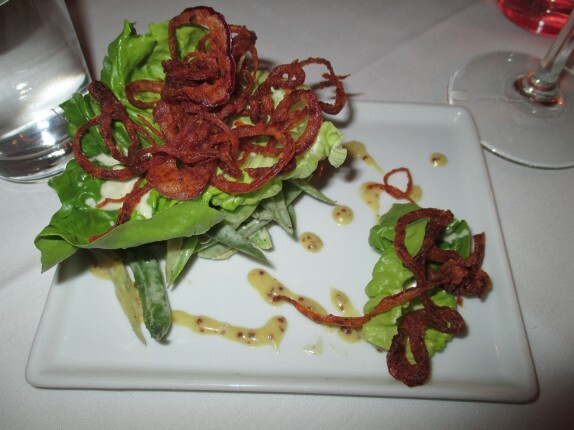 The green beans were tossed in a creamy dressing and were topped with butter lettuce and crispy fried shallots. I didn’t want this dish to end. 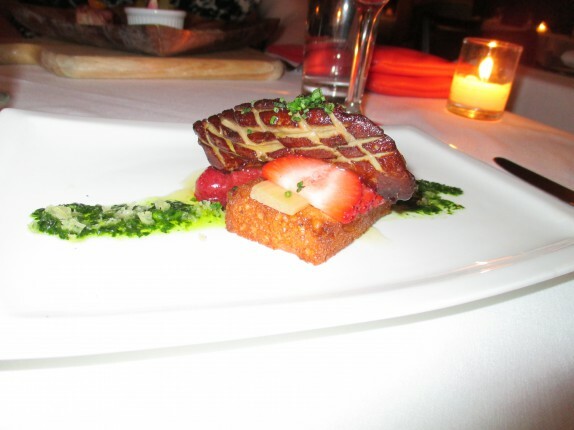 The foie gras was cooked perfectly and was served atop ingredients that really made the dish shine. The butter fried crouton was a great base for the fruity and rich goodness of this dish. There were a few chives garnishing the dish, but I felt like they really helped punctuate the dish and round out the flavors. 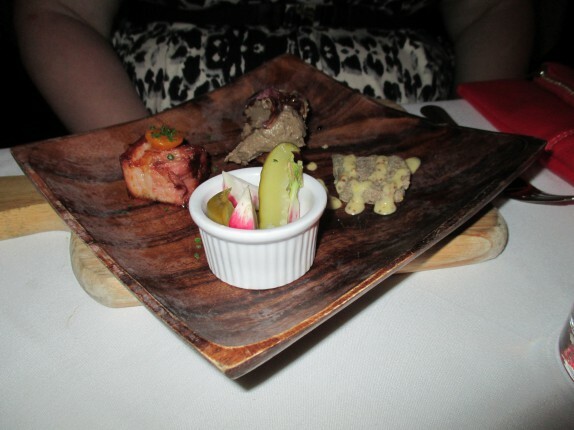 I can’t say either of us were keen of the components on the charcuterie platter. 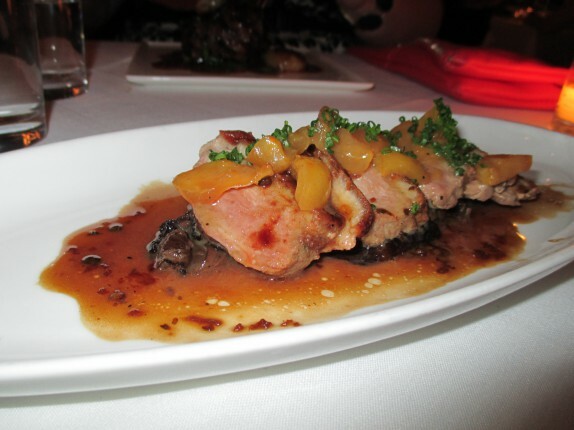 I most enjoyed the veal bacon, which was unctuous and was an umami-bomb. Next was Butter-Poached Maine Lobster (Paffenroth Gardens spinach, grilled lemon) and Charred Octopus (market cress, marinated cucumber and watermelon). 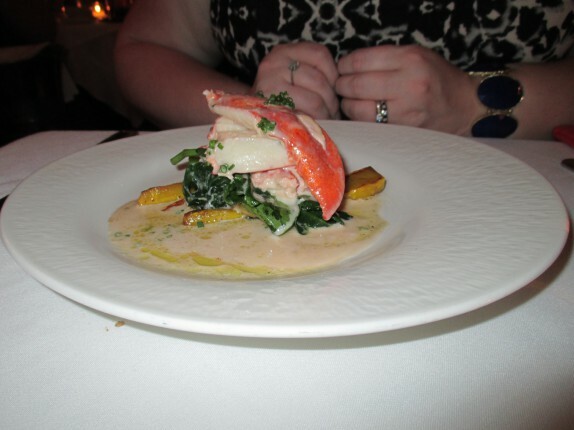 What can I say about that lobster dish, it was everything I expected and then some. The lobster meat was perfectly cooked and deliciously rich. The grilled lemon was an interesting spin on the lemon-with-seafood convention, and the spinach added some contrast and minor bitterness. The octopus dish was (in my opinion) the best of the night as far as the savory dishes. This dish was masterfully constructed. The marinated cucumber and melon were the base; the acidic additions managed to break both down just a little to create a very subtle tightness to the marinade. From tasting the octopus (which historically has not been a favorite protein of mine), I feel like it was first poached and then charred on the grill. It was beautifully tender. Taking bites of everything together, the cucumber and watermelon flavors and textures volleyed between the octopus, which brought chewiness and char. The greens (in this case cress) on the plate again punctuated the dish and layered a peppery bite atop everything else. It took a while for our next courses to arrive, and that was ok because that gave time for the second of my dreams to come true. I saw a bunch of commotion toward the back of the restaurant, and I saw people snapping pictures. At first, I didn’t recognize Chef Alex. We were about 4 rows of tables away from the back of the place, and Chef Alex stopped and spent a few minutes with each table. When she came over to our table, we could see the fatigue in her face, and she explained that she had just come back from a 16 hour Iron Chef America taping, and that she was really wired and wanted to go home and zombie out to a bunch of Sopranos episodes. We talked at length about how amazing The Sopranos was and moved onto her other favorite show, Breaking Bad. I shared with her the humor of being a chemist and being asked if it’s anything like Breaking Bad all the time, and she laughed. I got a chance to compliment her on the conception of the octopus dish, and she offered to be in a picture with us. She talked to us for at least 5 minutes. After she moved on, our next and last savory courses arrived: Grilled Filet of Beef (wild spinach and caramelized cippolini onions with fresh chilies) and Hudson Valley Duck Breast (white cherries, grilled radicchio). The cook on both of these proteins led me to believe they sat to rest a little too long, probably because I wouldn’t stop talking to Alex. Ohh well. 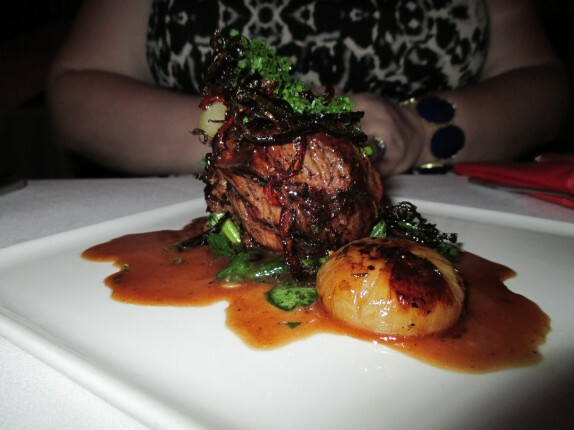 The beef was very good; I felt like this was the most classically prepared dish. The duck dish was a tug of war of senses; sweetness from the cherries and sauce, bitterness from the radicchio, richness from the duck, and a whole lot of salt to bring it all together. 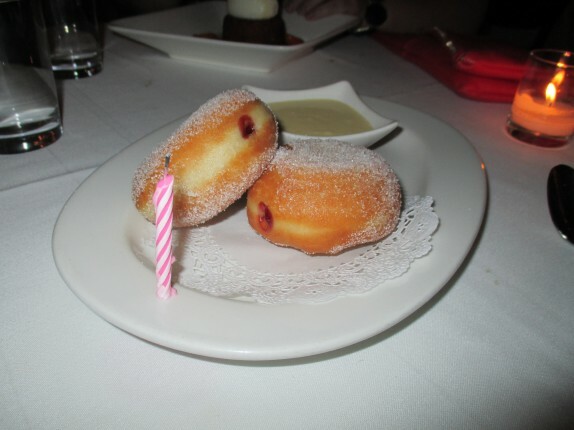 It took quite a while for dessert to arrive, but when it did, it arrived with a bang. 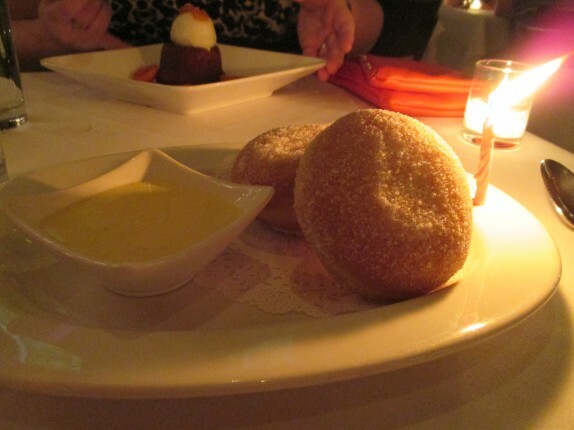 Raspberry Beignets (vanilla dipping sauce) and an Apricot mini bundt cake with vanilla ice cream. The beignets were, in a word, brilliant. The apricot cake was also very good. 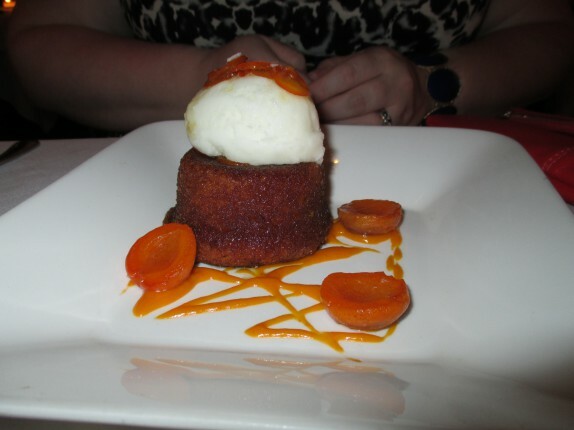 Between the sauce, the liquid drenched over the cake, and the fresh fruit, apricot really resonated through the dish, and it’s the tangy type of fruit I love with dessert. The ice cream provided a fun contrast for each bite. Each course was paired with wine, but I focused more on enjoying the food and didn’t really take any notes on the wines. What I do remember was that none of the wines stood out as great and, furthermore, they didn’t really pair tremendously with the dishes. If I ever go in the future, I’ll either stick to cocktails or order a bottle (or glass) of my favorite wine. 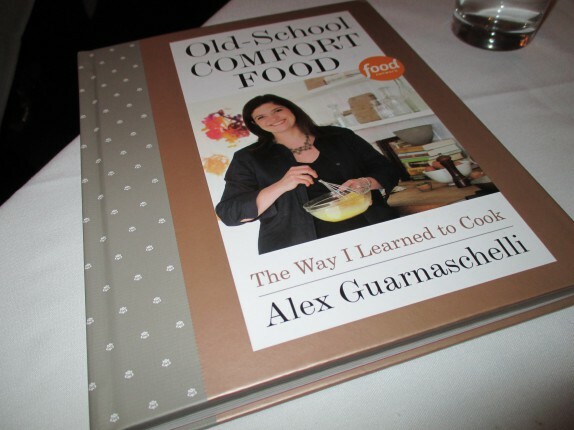 One more thing I sprang for that night was a signed copy of Alex’s book, Old-School Comfort Food . It costed me $4 more than the price of the hardcover on amazon. The meal was excellent, and it was awesome to sample so many things on the menu. If I had to choose an appetizer or two and a main course, I would have never experienced a few of the dishes outside of my comfort zone that really made the meal. The evening went by very quickly, but there were plenty of special memories. This my friend is a masterpiece…I loved it! And the courses! 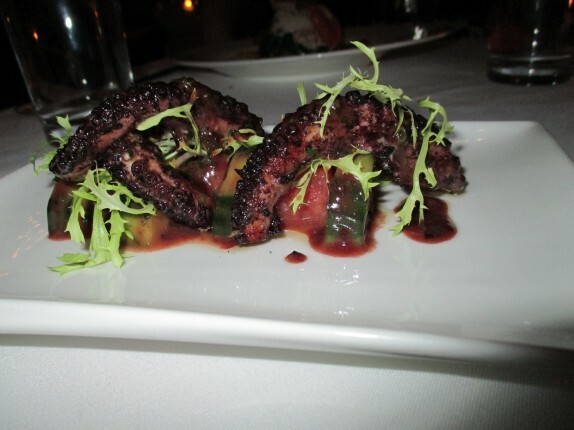 I was really intrigued by the grilled octopus…would love to see you and your beautiful wife in your own food show! I’m serious! Sounds like an awesome experience on so many levels–great stuff! Which one is Alex? The one in black or in the print?